A child's house burns down, leaving everyone and everything she has behind. From this moment, a singular journey begins. 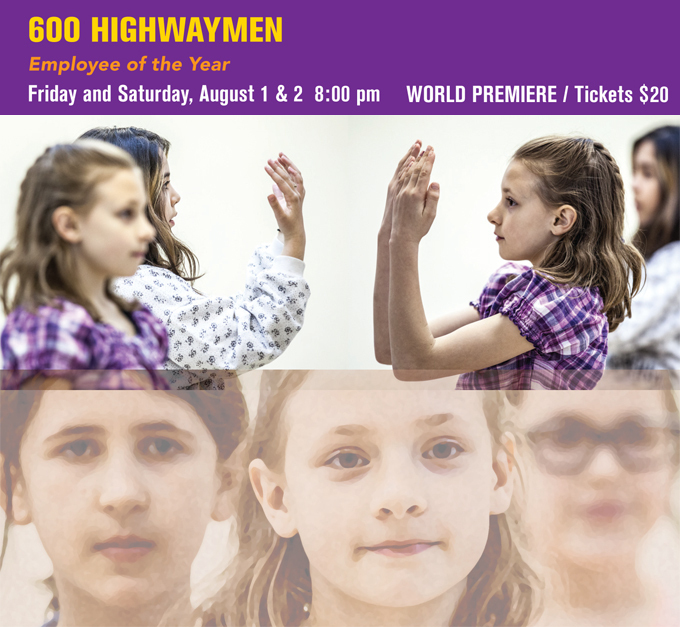 600 HIGHWAYMEN’s Employee of the Year brings together five girls under the age of 11 in an attempt to probe what it means to grow up and how people become who they are. Combining 600 HIGHWAYMEN’s arresting theatrical style with original songs by Obie Award-winner David Cale, this New York premiere intimately investigates the process of transformation over a lifetime. Under the name 600 HIGHWAYMEN, Abigail Browde and Michael Silverstone construct expansive performances that illuminate the inherent poignancy and theatricality of people together. Developed using creative methods ranging from the mainstream to the peculiar, their work is a rigorously tuned investigation of presence and humanity, not only in performance, but also in process and aftermath. 600 Highwaymen’s Employee of the Year is co-commissioned by Mount Tremper Arts with support by The National Endowment of the Arts, Arts Works grant, and a commissioning grant by The New York State Council on the Arts Theater program with the support of Governor Andrew Cuomo and the New York State Legislature. It is co-commissioned by the French Institute Alliance Française (FIAF) as part of FIAF’s Crossing the Line Festival 2014.